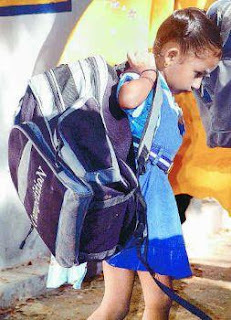 Schools load the bags and children bend like question marks under the weight. It is evening and Divvya's mother is helping her pack school bag. Mother and daughter go into a tizzy on seeing the time table. “I want to take all the English books, otherwise teacher will make me kneel down if I don't have the book she is teaching,” says Divvya, a Standard II student of an upscale school in Jubilee Hills. Packed and ready, the school bag weighs 9 kg with the munchies and without the water bottle. Another evening and a young boy at Lakdi-ka-Pul rushes to catch an RTC bus towards Mehdipatnam. He swings his arms as he bends under the weight of the bag. Vipul is a Standard X student of a Kendriya Vidyalaya. We try to weigh his bag at a fruit vendor. The fruit vendor doesn't have enough weights, but the electronic scale at grocery shop comes to the rescue: 11 kg. It is not that parents are oblivious to the problem. “Seeing the weight of the bag, we bought a wheeled bag for R. And I thought it must be relieving the agony, till one day I went to the school and discovered that the wheeled bag had to be carried from the bus to the staircase and then the lift is from the first floor only. I felt terrible,” says his mother. So what happened to the much tom-tommed educational reforms by Kapil Sibal, who promised to lighten school bags and make education stress-free? Well, the ICSE and CBSE schools have quietly buried them under a heap of books. On an average, there are seven or eight periods in a day. Each period involves a minimum of three books: a textbook, a workbook and a notebook. Even drawing class requires not just blank pages for freehand drawing but also a textbook with half-drawn images. A book shop owner who also sells non-educational items says, “Part of the problem is the group of book publishers who strike deals with schools that are very good for the top bosses of educational institutions.” It is not just the weight that is the issue, the cost of books makes education expensive for children who are entitled to a free education under the Right to Education Act. It violates the principle: “No child shall be liable to pay any kind of fee or charges or expenses which may prevent him or her from pursuing and completing the elementary education.” To put things in perspective we spoke with Mohan Chandra, a musculoskeletal physiotherapist. His opinion flies in the face of common wisdom. “If children carry some weight on their back actually it might be good as it prevents Scheuermann's disease later in life.” But overall he feels bags should be lighter. “Children grow till the age of 21 and little curve of the upper spine may be beneficial, but carrying too much weight can result in hyperextension in the cervical regions which will have long-term consequences,” he says. “The weight of the school bag should not exceed the body weight of the child by more than 20 per cent,” he says. Author R.K. Narayan made only one intervention during his stint in the Rajya Sabha and that was about the weight of school bags. RTE Act has one sentence about curriculum: The curriculum and evaluation procedure for elementary education shall be laid down by an academic authority to be specified by the appropriate government. July 15 marked the 18th anniversary of submission of Learning Without Burden Report Of The National Advisory Committee (Yashpal Committee).